Why pay someone for a renovation that you can do by yourself? Why rely on others when you can exercise complete control over every aspect of the design process? With the right care, time, and budget, getting crafty and putting things in your own hands can lead to great fulfillment and wonderful results. This particular makeover is an incredible example of just what you can do with a tiny budget and big dreams. When Sarah and Bradley purchased their 1984 Shasta travel trailer, it was definitely trapped in time with its dark wood paneling, floral upholstery, and beat-up exterior. After a lot of thought and hard work, it became a stylish and contemporary masterpiece of tiny living. Standing inside this Shasta, you would never be able to guess its age. Clean whitewashed walls, light wood floors, and gold accents make this vintage beauty look as good as new. When traveling with a family of five, sleeping arrangements can be tricky, and multi-use beds are key to saving space and staying comfortable. This couch can be converted into a queen bed for the parents. We adore Sarah and Bradley's handbuilt ladder. Climb up the blue ladder rungs and you'll find the large bunk, perfect for the kids. This trailer is also filled with gorgeous details including these hand-sewn pillows and birch-tree curtains. For such a tiny space, this kitchen really packs a punch. While it might be small, it has all the necessities and, once again, the beauty is all in the details such as the chalkboard fridge, magnetic knife display, and adhesive subway tile backsplash. The wildlife theme stays strong in the bathroom which features more birch tree patterns and a cute little critter for some wall art. Across from the newly installed sink and countertop, you'll find the shower and toilet which makes camping all the more enjoyable. Huge improvement, right? To check out more of Sarah, Bradley, and Myrtle's adventures make sure to follow their Instagram page myrtlesmakeoveryyc. Don't forget to share this article with your friends on Facebook and let us know what you think in the comments! 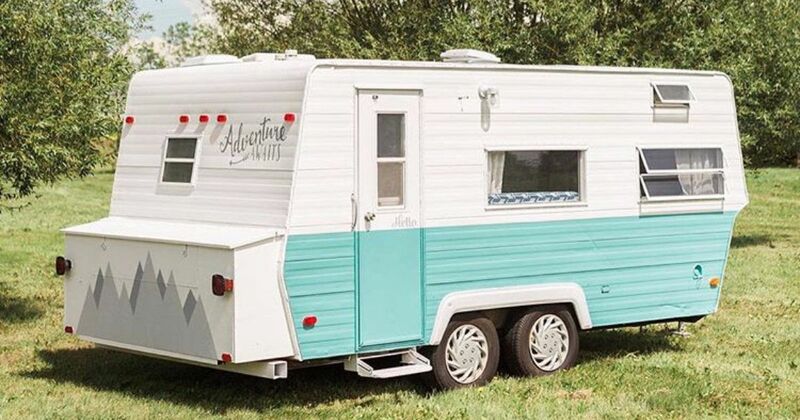 This little vintage Coachmen trailer is full of surprises. Check out the lavish interior of this vintage trailer!